the summer has hit Prague with full power. The temperatures are above 30 Celsius in the shade. Fortunately, our office is in the old stone building, so the climate here is quite comfortable even without the air-conditioning. So the original 0.12.0 projected release day is today. And unfortunately it won't happen. We are almost there but not quite, so we decided to postpone the 0.12.0 release to the next week, which at the moment seems actually very realistic (nothing is 100% though - for instance if an asteroid hits the office we probably won't release). All of the planned major features are done. Most of the team has participated in the bugfixing efforts this week led by kovarex. Many issues both from the forums and our internal task board have been closed. However we got to playtesting only yesterday and there are still issues especially in the multiplayer determinism. Surprise, surprise =)) Well, considering the how big the update will be it would be a bit of a miracle if things "just worked" (even with tests passing and separate functionalities tested separately during the development). community management at the forums / facebook / etc. When resizing / alt-tabbing or anything else while having this feature (saving V-RAM) set the game graphics just collapse. You can see a screenshot below. This was not the case in 0.11 because the mentioned drawing optimisation hasn't been implemented yet back then. The whole mechanism of saving VRAM might have been an illusion all the time (at least on Windows). 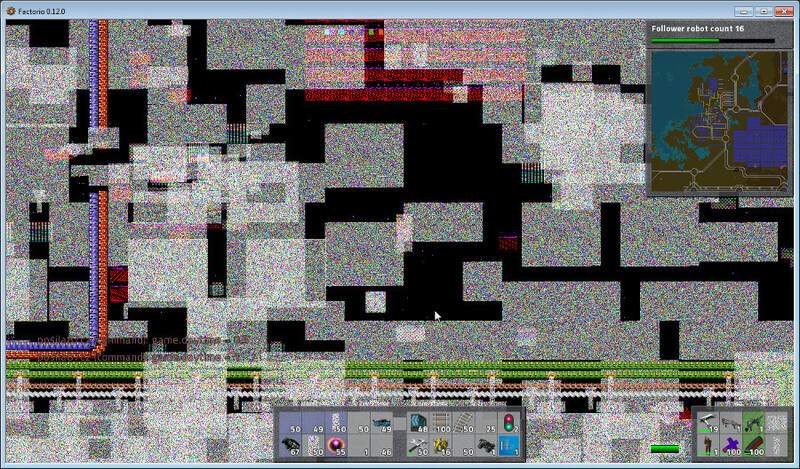 The memory bitmaps seem to be stored in the VRAM anyway. Michal is at the moment looking into this because we really need some mechanism for saving the VRAM - Factorio is especially hungry in this regard. This is what you might see as a Factorio developer (and unfortunately sometimes as a gamer too). Let us know if you are looking forward to 0.12.0 same as we do at our forums. Now I go back to playtesting=)). Edit (kovarex): I did measure it, and in 0.11 I get FPS/UPS 2.5/7 and in 0.12 I get 22/22, so the update simulation speed is 3 times faster here as well.